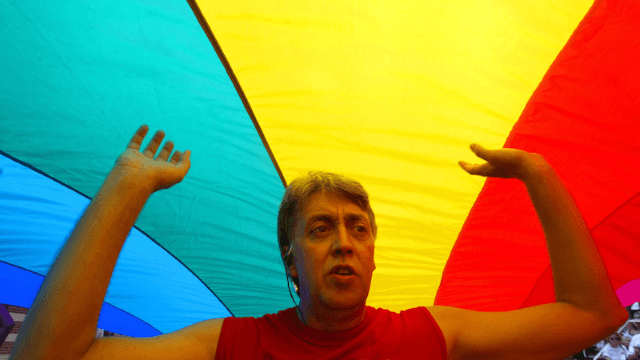 The internet honors the life of gay rights activist and rainbow flag creator Gilbert Baker. Gilbert Baker, the man who once famously described himself as a "gay Betsy Ross" was found dead in his home on Friday in New York City. He was 65. Baker was a well-known gay rights activist, and most famous for hand-dyeing and sewing eight strips of colorful fabric together to create the first iteration of today's gay pride flag. That was in 1978 in San Francisco, when another famous gay rights activist and city supervisor, Harvey Milk (who was later assassinated), asked for Baker's help putting together a symbol for the movement, The New York Times reports. Today, we mourn the loss of Baker, celebrate his vibrant life and remember the great additions he made to the gay community. Here are some of the tributes to Baker from fans, allies and celebrities from around the world. Gilbert Baker, who designed the first #LGBT pride rainbow flag, has passed away.